When I say these are the easiest hot ham and cheese sandwiches I’ve made, I truly mean it. 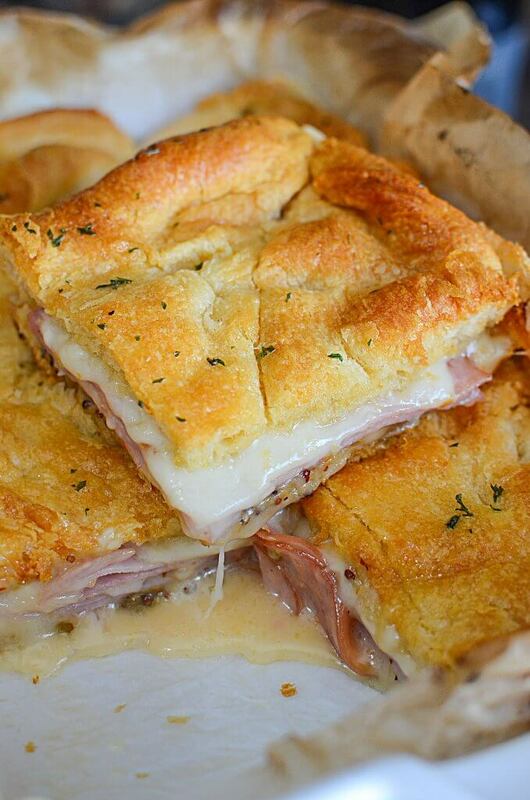 Now, these aren’t your typical loaf of bread ham and cheese sandwich. These are … well, kinda amazing actually. Buttery and cheesy, with a tiny little kick from the (optional) pepper jack cheese. OH yeah, when I say easiest, I might even mean tastiest as well. The reason why these sandwiches are so easy to make it because there’s no buttering of the bread, piece by piece. No individual type assembly. It’s all done in one dish. What Ingredients Do I Need To Make These Hot Ham and Cheese Sandwiches? 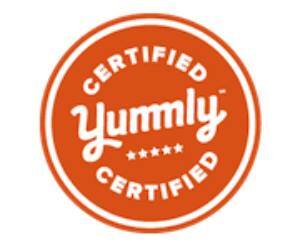 All the ingredients are EASILY obtained by your nearest major grocery chain! That’s the beauty of this recipe! 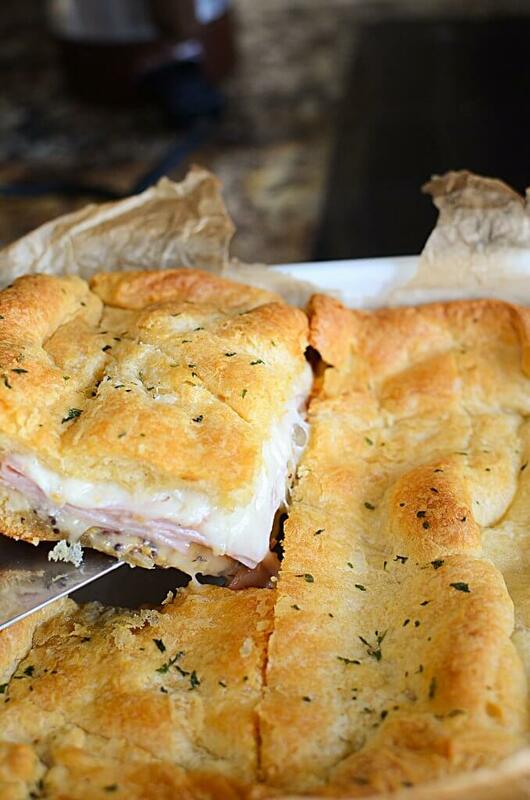 It’s a sandwich, but hot, cheesy, hammy, and not like your typical two pieces of bread sandwich! What Types of Cheeses Can I Use? Even a sliced blue cheese if the feeling struck you..
Can I Add Extra Types of Meat? Yes of course! I used a black forest ham with this recipe, but you could certainly mix up the types of ham (honey ham, sandwich ham, etc) or even added some other types of deli meat if you chose to. I would just be a little conscious of cheese and meat pairings when you’re deciding on what to use. How Do I Assemble This Hot Ham And Cheese Sandwich? The trickiest thing (which isn’t tricky at all) is the croissant dough. When it comes out of that ‘jack in the box’ tube, and you unroll it, you’ll just have to press the seams together because they are perforated for the croissant roll-ups. Other than that, it’s simple! They come together pretty darn quick and easy, so you can feed a few ppl all at once. AND, if you make two at a time, you can feed a crowd! Plus, if you are feeding an even bigger crowd, you can make these Easy Italian Sliders and/or my Chicken Cordon Bleu sliders as well! They are seriously a hit at EVERY function I make them for! Lastly, if you’re looking for a side dish to serve these delectable sandwiches with, try this 6 Minute Instant Pot Potato Salad, together they’d make the perfect meal!!! let the sandwiches rest a few minutes after they come out of the oven. That cheese is lava hot, so you don’t want anyone to burn themselves! 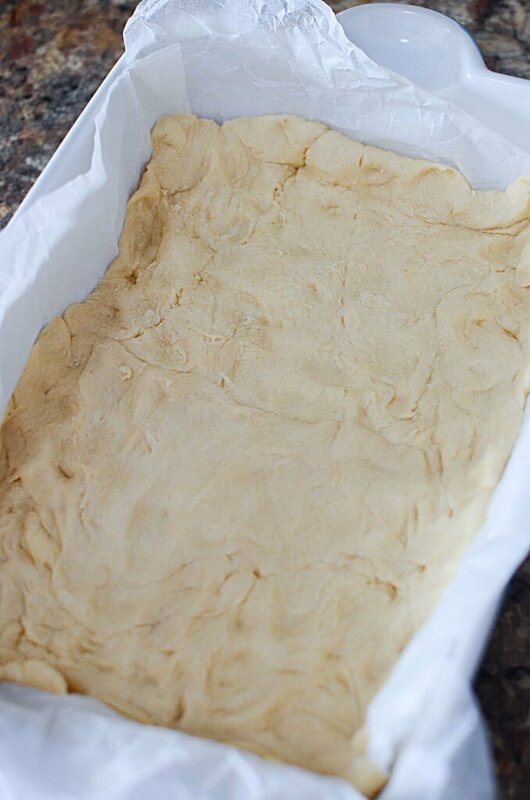 store brand croissant dough usually works just as well as brand name croissant dough. So if you have access to that and can save some money, use that! use dry parsley instead of the fresh when putting in the butter. Fresh parsley seems to clump up too much. Well, there you have it, folks! I hope that when you try these delicious and incredibly easy hot ham and cheese sandwiches that you give me a shout below and let me know what you thought! Did you switch up the meat or the cheeses? I’d love to hear about it! Thanks so much for stopping by The Salty Pot today, and have a fantastic day! 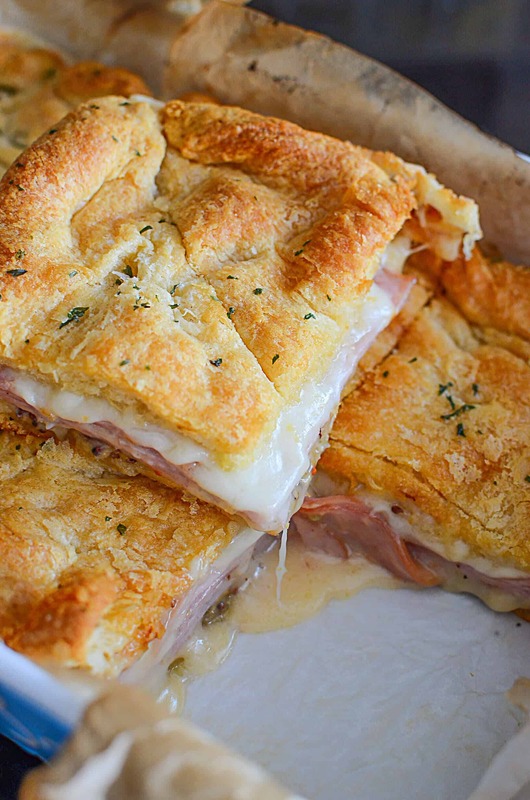 Flaky, cheesy and hammy, these Easy Hot Ham And Cheese Sandwiches are super delicious and can feed a bunch of people at a time! Perfect for a crowd, parties and game day!! Take the dough out of the tube and roll it out. Press the seams together to form one large piece of dough. Line or grease a 7 x 11 baking dish with parchment paper or nonstick spray. 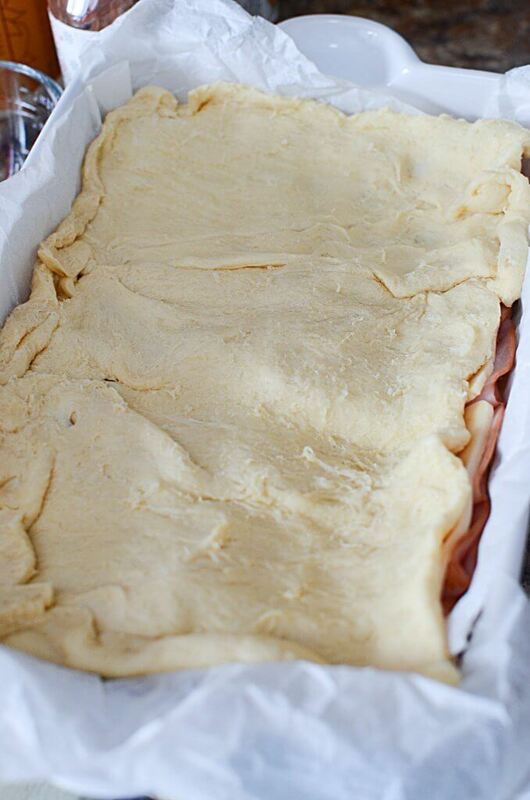 Lay the dough down in the baking dish and bake for the time required on the tube. Remove when cooking time is up. Spread the dijon mustard over the top of the cooked croissant bread. Layer on 4 pieces of cheese or as much cheese as you would like to cover the surface of the bread. 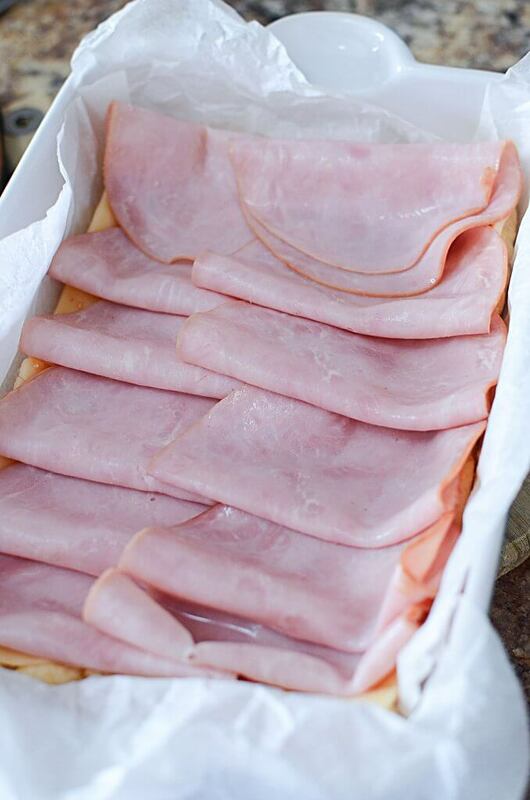 Fold each ham peice in half and layer on top of the cheese. Top the ham with the remaining slices of cheese. Remove the second batch of dough from the tube. Again, pinch the seams closed, and place on top of the cheese slices. In a small bowl, melt the butter, and add the parsley and garlic. 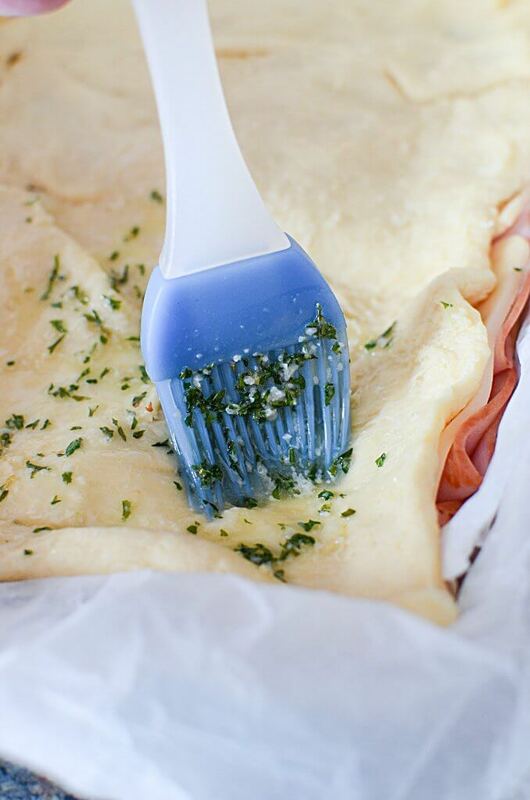 Brush on top of the dough. Bake in the oven for 20 - 25 minutes or until the dough is golden brown on top, and the sandwiches are heated through and the cheese is nice and melty! 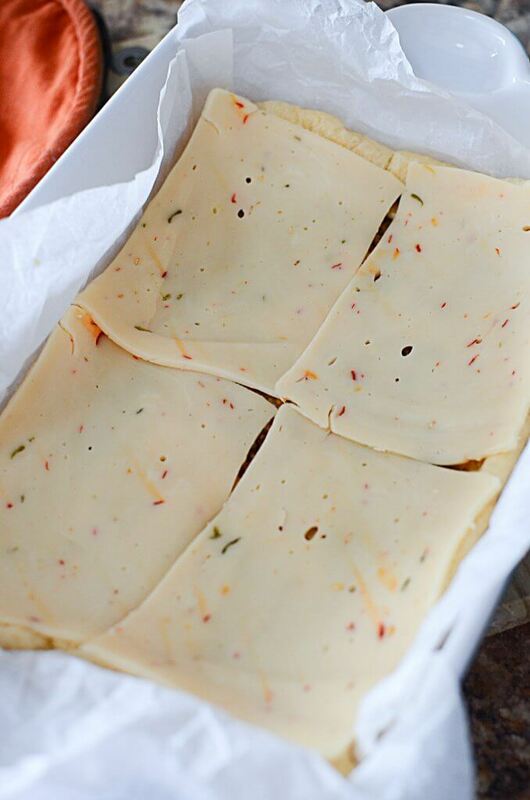 Remove from the oven and let rest for 5 minutes to cool slightly as the cheese will be VERY hot and can burn easily! Enjoy! « ALL ABOUT THE NINJA FOODI! Does the first tube of crossiant burn during the last baking time since it’s being baked twice ( the bottom layer)? Thank you Diana!! Please let me know what you think of it when you make it!! I’d love the feedback! Hi Ruth! Thanks for reminding me, I’ll add that info to the recipe!! I used an 11 x 7 baking dish!